Again a victory, this time in Bergamo against Atalanta the team we could not beat yet in their own stadium since our return in Serie A just more than 2 years ago. The deciding goal was scored out of a corner by Emiliano Moretti in the 45th minute with a header. Because of the many injuries Mr. Gasperini chose Tomovic and Fatic in the line-up and both played very good. In the 2nd half Genoa had many chances to decide the match definitively but all were missed, so we had to wait till the 93rd minute before we finally could celebrate this important victory in a difficult away-match. With 6 points in 2 matches Genoa stays, of course, on top of the standings together with Juventus, Lazio and Sampdoria. The next match of Genoa is Sunday 13th September in Luigi Ferraris against our friends of Napoli and we hope many injured players can return in the team after the break of the National teams next weekend. This summer Genoa and Atalanta changed their central-forward: in the team of Bergamo plays now Robert Acquafresca (who is still owned by Genoa) and with us Sergio Floccari. A good choice of our staff because Floccari is more experienced and a young player like Acquafresca has to play every week to become more experienced. 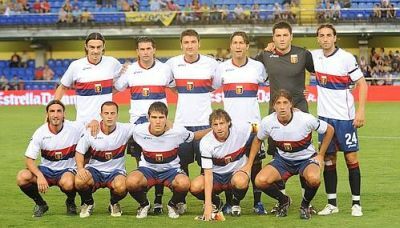 The only problem now: both central strikers of Genoa: Floccari and Crespo are injured while Acquafresca is healthy. Besides the 2 central-forwards Mr. Gasperini also had to leave the other strikers Jankovic and Palladino at home, so only Sculli, Figueroa and Palacio went with the playerscoach to Bergamo this afternoon. Besides the offensive problems also Bocchetti and Juric can not play tomorrow-evening at 20.45 hours. 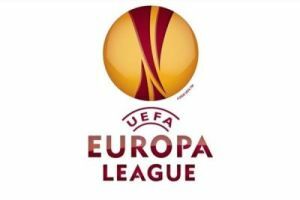 Valencia, Lille + Slavia Praha opponents E.L. The draw this afternoon in Nyon, Switzerland brought Genoa in group B with Valencia (Spain, that beat Stabaek IF with 7-1 in the play-off round), Lille (France, beat Genk by 6-3) and Slavia Praha (Czech Republic, eliminated Crvena Zvezda by 4-2). Genoa starts at Thursday 17th September 19.00 hours with a homematch against Slavia Praha and ends the groupfase with another homematch exactly 3 months later at Thursday 17th December 19.00 hours against Valencia, the favorite of this group. Tonight Genoa draw 1-1 in Denmark against Odense BK which makes the total score 4-2 and qualification of Genoa in the Europa League. The goal of Genoa was scored by Mimmo Criscito in the 53rd minute. The openinggoal of Odense was unluckily scored by our central-forward Luciano Figueroa who headed a corner behind Amelia in the extra time of the first half because of the injury of Ivan Juric. Genoa started the match with Figueroa in the line-up instead of slightly injured Crespo. After 10 minutes everybody, except Beppe Sculli, was in shock when Djemba Djemba headed Juric and our midfielder swallowed his tongue. Luckily Giuseppe Sculli has studied to be a doctor and he saved Juric who was substitued by Omar Milanetto. In the 38th minute Omar hit the post with a shot from just outside the penalty-area. In the injurytime of the first half Odense got a corner that was unluckily headed in by Figueroa, 1-0. The sufference lasted only 8 minutes in the second half when Mimmo Criscito scored the 1-1 equalizer. After the goal of Criscito Genoa controlled the match which ended by 1-1. Genoa-fans in and around Amsterdam can watch the match on a big screen in Satellite Sportscafé in the centre (Leidseplein) of the capital of Holland. Only 72 hours after the match against Odense our red and blue team again booked a victory: 3-2 against A.S. Roma. Mr. Gasperini changed his line-up at 5 positions: Bocchetti (injured), Milanetto, Criscito, Palacio and Figueroa were substituted by Sokratis, Zapater, Modesto, Rossi and Crespo. In the first half Genoa was for sure the best team in the field but we did not create many chances, while Roma only had 1 big chance of Totti that was fantasticly saved by Amelia. At halftime our coach substituted Mesto and Modesto by Palacio and Criscito, who scored the first goal of the season after only 4 minutes when he shot the ball with his right (!) foot in the far corner: 1-0. The happiness lasted only 15 minutes in which Taddei (header) and Totti (luckily touched a shot of Guberti) changed the score into 1-2. But Genoa with the help of the fantastic fans in the stadium did not gave up. In the 69th minute Juric was stopped irregulary by Andreolli just outside the penalty-area. Our new Spanish central midfielder Alberto Zapater shot the free-kick directly high in the left corner of the goal: 2-2. The last 15 minutes both teams tried to win the match, but Genoa surely was the strongest. In the 83rd minute the reward arrived when Giuseppe Biava scored the 3rd and last goal behind goalkeeper Artur of Roma, who first stopped the shot of Sculli: 3-2. The third goal was also made by Figueroa after Sculli hit the crossbar and Biava’s rebound was blocked by goalkeeper Carroll towards Figueroa who did not think for a second: 3-0. The joy lasted only 2 minutes when Gislason brought the 3-1 on the scoreboard. After the goal of Odense both teams had some changes, but the match ended with 3-1 and a heavy ankle-injury of our young defender Salvatore Bocchetti. The return is next week in Odense with a Dutch referee: Björn Kuipers. 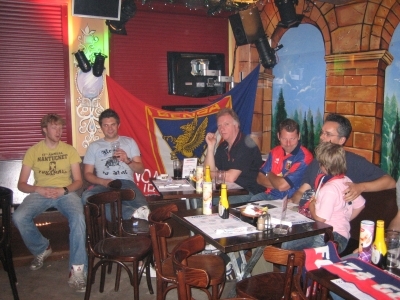 Thursdaynight at 20.45 hours all Genoa-fans in the neighbourhood of Amsterdam can watch the first Europa League play-off match Genoa – Odense BK in the Sattelite Sportscafé in the city-centre of Amsterdam (Leidseplein, next to Bulldog). In Spain Genoa has beaten Villarreal, the topteam of Spain that reached the quarterfinals of Champions League last season in which they were beaten by Arsenal. Genoa missed all their international players (including Mimmo Criscito who played his first match in the Squadra Azzura) that played with their national team yesterday. In the 1st half Giuseppe Sculli scored the first goal with a header and just after halftime Hernan Crespo doubled the score. Villarreal scored by penalty their goal: 1-2 and Hernan Crespo missed a penalty that was deserved by captain Marco Rossi 20 minutes before the end. The victory 1 week before the match in Europa League against Odense BK is very important to Mr. Gasperini and his staff after the 0-3 defeat against Olympique Nice 2 weeks ago. In the meanwhile Anthony Vanden Borre was rent to Porthsmouth (Premier league), so this season there is no Dutch or Belgian player in the team of Genoa.